CANTON, MA (November 3, 2015) – Dunkin’ Donuts, famous for always making its entire menu available all day long, is celebrating National Sandwich Day today with a new addition to its breakfast sandwich lineup. Dunkin’ Donuts is now offering the new Sweet Black Pepper Bacon Breakfast Sandwich, a unique combination of sweet and savory featuring egg, a slice of American cheese and four strips of bacon coated in a seasoning that includes brown sugar and black pepper, served on a croissant. 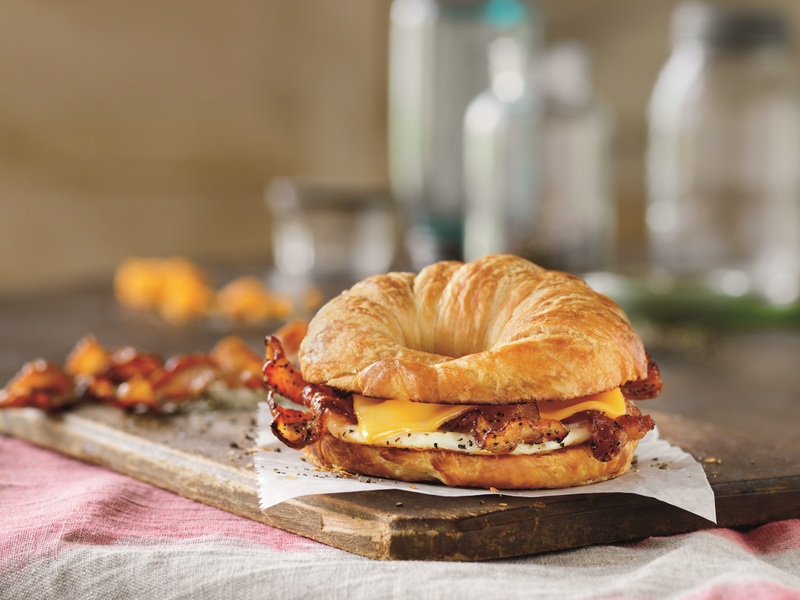 The Sweet Black Pepper Bacon Breakfast Sandwich is also available as a Wake-Up Wrap®, with ½ egg, a slice of American cheese and one slice of the special seasoned bacon, served on a 5.5 inch tortilla. Both are available for a limited time at Dunkin’ Donuts restaurants nationwide. With several breakfast sandwich choices featuring favorites such as cherrywood smoked bacon, sausage, aged cheddar cheese, freshly baked croissants, bagels or toasted English Muffins, Dunkin’ Donuts provides delicious and satisfying options available all day long, so guests can start the morning and keep running with Dunkin’ whether it’s 8 AM or 8 PM. Dunkin’ Donuts also offers a full lineup of bakery sandwiches, such as Bacon Ranch Chicken, Turkey, Cheddar & Bacon, Chicken Salad, and Tuna Salad sandwiches, available any time of day as well.